I’ve seen a lot of different strategies for increasing action on a landing page but this was the first time I saw someone use sleight of hand! I recently wrote about split test and provided a list of resources that I use to help me identify test ideas. However, this one isn’t in those resources! Sleight of hand is used to manipulate or deceive you into believing something that isn’t true. A magician wants you to believe the coin disappeared or the rabbit really came out of an empty hat! And in this landing page alteration I’m about to show you, they wanted you believe you were getting a better price, when really there is no discount at all! The first time I saw this I didn’t catch the trick. I saw what they wanted me to see! I was doing research on WordPress page builder plugins and was on Beaver Builders site. I had looked through a lot of their content and had I even looked at the pricing page a few times. 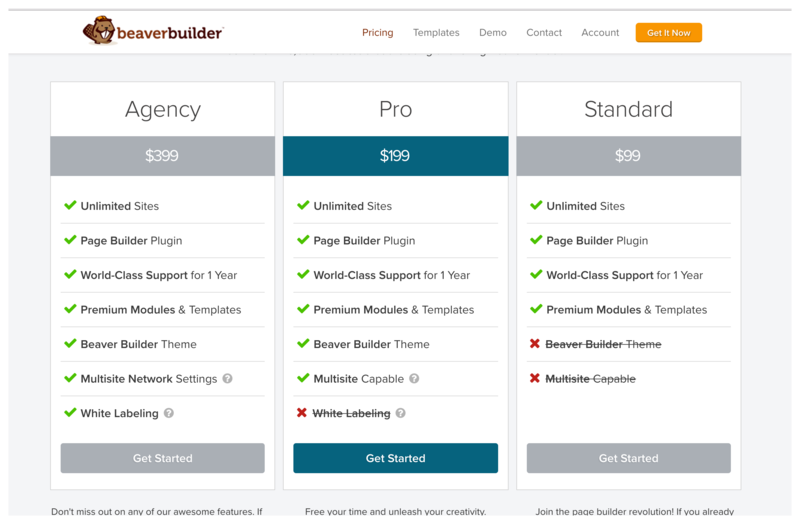 Not long after that, I was in my GoDaddy Pro account and noticed that they had a partnership with Beaver Builder and had a reward deal setup for pro members. If you don’t know, these rewards are discounts to products and services a WebPro needs to run their business. I clicked through to the Beaver Builder site and this is what I saw, or thought I saw! But I’ll break it down for you anyway! It’s in the order of the pricing columns. And the colors are used to draw your attention to the different columns. On their main landing page, the columns are, from left to right, Agency, Pro, Standard. On the now no longer to be found GoDaddy landing page, the columns are, Standard, Pro, Agency. At first glance I thought the Agency plan was discounted to $99. I thought I was now getting the best option at the best price! Here it is in a stacked view. 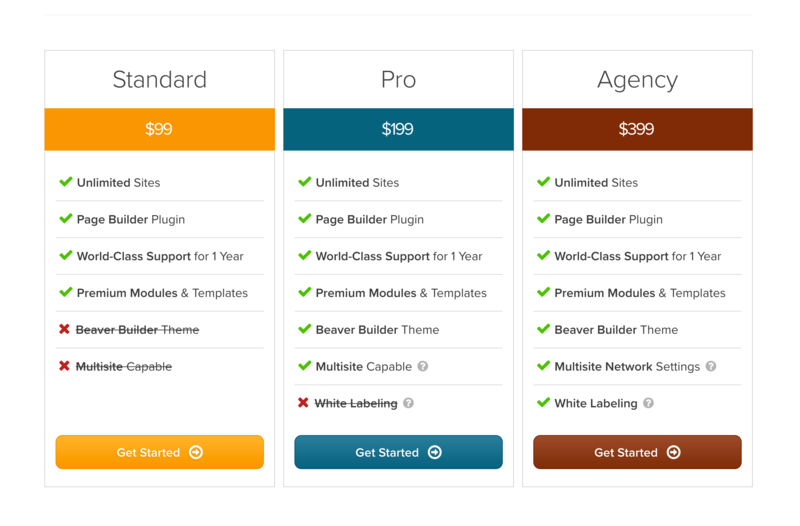 Keep in mind, the pricing tiers were not the only thing that changed on the landing page. Sleight of hand does work without some distractions. They had a GoDaddy branded landing page, different layout, different colors, different content, oh it was tricky. If you’re starting your relationship off with deception, I’m going to say no it won’t be good for you in the end. It may get some sales or more click throughs, and people may think they’re buying something else which will lead to cancelations and refunds. When I caught on, I felt like I was being tricked. They were promoting a “perk” or “promo” where there really wasn’t one! If you’re going to try something like this, I’d suggest actually adding value, not just a trick. My other concern in this situation, they were targeting web pros, and as demonstrated my focus was on the Agency plan. So even if I purchased the standard plan thinking it was agency, I’m not going to be happy, and I’m most likely not going to upgrade. Keep in mind, this is only seen by a targeted segment of your audience, and they are only going to see the trick if their comparing prices from the promo page and your main website pricing page. However, I do believe this sleight of hand trick will get people to think twice and/or click a call to action. The real trick is getting them to like it. So in this same situation, what if the prices actually changed? The columns still swap but the pricing does too? Do you change all pricing, just the Agency plan or just the pro plan? Make the standard plan a free trial with a discounted upgrade path in 30 days? You could even add a link that will take them to your main pricing page, “compare your pricing with our listed prices”. If you want your marketing and promotions to be effective, don’t be deceptive. Changing the order of your plans is a good way to test because it mixes things up a bit and forces our brains to reengage. But for that person who is on the fence, pulling a sleight of hand that is nothing but a trick, will likely just push them over the fence to your competition.